Yachts transiting the Panama Canal have three choices for position. Center chamber is where you are held in place with four lines. Rafted is where you tie alongside another vessel, typically a tug. Third position is alongside the canal wall. Of the three, the latter is rarely used as it makes a mess of your topsides and/or fenders. But Cochise chose the side-tie method because she could use a combination of counter-rotating props and opposing rudder deflection to create side thrust, thus keeping the topsides well clear of the canal sidewalls. In the following video, we’ll take you on a tour of the canal, as well as demonstrating our line handling and engine/rudder technique. This entry was posted on Thursday, December 1st, 2016 at 4:39 am and is filed under Dashew Logs, FPB 78, FPB 78 Videos, The Logs. Both comments and pings are currently closed. Once entered into a lock does the transit authority require the vessel to be tethered? Is it too difficult/problematic to hold station in the centre of the lock under engine/thrusters? very vessel in the Canal has a canal pilot aboard and he tells you what to do, communicates with the lock master and line handlers, etc. Sitting mid-lock with no lines would be very risky becuase of currents. Holding station in the centre of the lock with engines/thrusters would be tricky to say the least. The current is unpredictable and never quite the same, and sometimes – especially going up when they sometimes do “a canalmaster special fast fill” – can be very very strong. You could most likely do it with some sort of Azipod-type steering propulsion, but fixed props and conventional rudders, I wouldn’t count on it. Way too risky, and understandably not allowed. I don’t doubt that the twin rudder and counter rotating props work quite well, especially if experienced in their use…I do wonder if the statement that they work “far better than thrusters” is maybe a bit overstated? If so, would you include a bow thruster in that statement? Yes, Gene, if you take the time to learn how to use the engines, rudders, and occasional spring lines, the prop/rudder set up on the FPB 78 is far more powerful than any thruster we would fit, plus allows more deft maneuvering. Cochise has a 12″ tunnel thruster generating up to 450 pounds of thrust. We tested this during sea trials, and then capped the tunnel. What was the horsepower going in to achieve 450 lbs of thrust? “Capped the tunnel” – Thruster not worth the hydrodynamic resistance? Did capping it have a measurable effect on performance/fuel consumption? I’ve suggested using water jets to you before (for both horizontal thrusters and vertically located at the turn of the bilge as roll stabilizers). A jet would have minimal impact on hydrodynamic resistance. If you could get adequate thrust at reasonable hp it might work. As I recall you were dismissive of the concept. Was this because of hydro. resistance of the jets or too much hp for the thrust required? The marine industry uses 25 pound of thrust per HP as a starting point. The thruster tunnel is capped capped to reduce drag and marine organism growth. We have used jets in the past, and founbd their thrust inferior to tunnel thrusters. I was just thinking, given you have two props and two rudders, if the rudders could be independently controlled so that they could be rotated at opposite angles, and I imagine the engines/props already have independent control, you could control rotation merely by playing with the two throttles (advancing and zeroing) and not worry about rudders and/or reversing gear. Dear Steve, it’s inspirational to see you two out cruising again. As one who not destined to cut the dock lines, following your adventures is a real treat. Two questions: first, what is the Watson maneuver you so dreaded in the canal? and second, will you be heading up the US coast or off to Bermuda or the Azores? 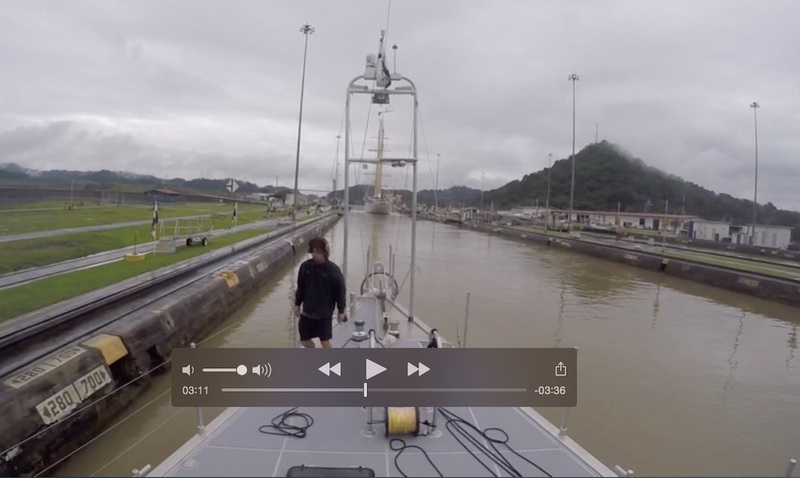 A Panama Canal “Watson” is when a line handler or the helmsman makes a mistake and you “kiss” (more like slam) into the Canal wall. Cochise is in Florida atr present. No firm plans about the future.